I don't know how many kilometres I'd travelled around India and Nepal but I calculated that I'd spent about 220 hours doing it. Anyone who has travelled in the sub-continent will realise this is a very long time to spend on the buses and trains! Altogether and including the trek I stayed in over 50 different hotels or guest houses. These ranged from a small room resembling a gaol cell to a luxury hotel with cable television, private bathroom and a revolving restaurant on the top. I left a trail of about 150 empty plastic water bottles behind me and contributed to their problem of waste management. Unfortunately India really has no idea (and probably no financial resources) to efficiently dispose of rubbish. Numerous times I found myself with rubbish or an empty bottle in my hand with nowhere to put it. The country needs about a million rubbish bins. But the question would then be who would empty them and where would it all go? Landfills don't seem to exist and more often than not it simply ends up in the street where the cows pick through and find something to eat. I often wondered about the health of these bovine creatures and was quietly thankful that beef was never on the menu! I reflected on the countless number of people I'd met and their extraordinary fascination of me. By now I am probably in numerous photo albums and perhaps even mantelpieces. I'd shaken more hands than I care to remember and even signed a lot of 'autographs'. The most common questions I was asked were 'what's your name?' (often 'what's your good name sir?') and 'which country are you from?'. This was often closely followed by whether I am married and the inevitable surprise when I offered my negative response. 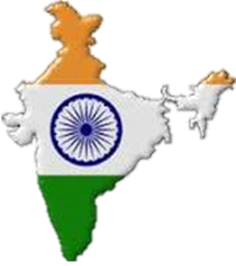 The Indian culture can be very endearing or very annoying depending on the situation and how you're feeling at the time. There is no doubt they always mean well and were often extremely helpful. Often when I was unsure about something or needed some help I merely had to stand looking a bit confused or get my guidebook out. Within minutes someone would be beside me asking if they can help. The flip side of all this was the shopkeepers, rickshaw drivers and hotel touts inability to accept 'no' as an answer. In an odd way, these two contrasts seemed to balance each other and preserved my sanity. Indians have some wonderful idiosyncrasies which are unique and sometimes amusing. Perhaps the best of these is the head wobble that makes them look like a puppet that is about to fall apart. It's a simultaneous nod and shake of the head that I never quite knew the meaning of. I'd often get it in response to a question and I decided in the end that it meant 'yes, you can do that but I'm not entirely happy about it'... or something like that! Unfortunately, the food in India will not be one of my favourite memories and I'll forever associate it with the health problems I encountered. Altogether, I lost about 14kg (20% of my body weight!) down various toilets and some days had very limited energy. The general standard of food hygiene was very poor and my body just never seemed to agree with the diet. Most dishes seemed to be too spicy and many food items were either deep fried or sickly sweet. The first thing I ate back home was a fresh salad and crisp apple! 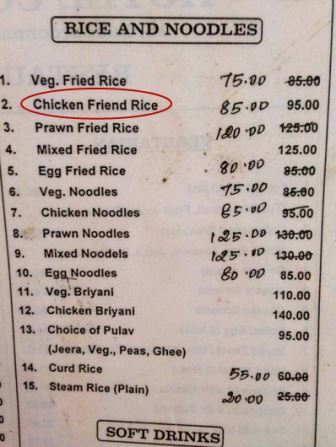 Indian menus often made me laugh! Being in an essentially vegetarian country I think I probably developed an iron deficiency. For three months I didn't have red meat or fresh green vegetables. One good thing though was bananas. They were sold in abundance and only cost about 50 cents a kilogram. Better than the $12 when I left Australia! I gave up buying apples because no matter how good they looked, one bite made me realise they'd been sitting too long in a warm temperature. Despite their odd unripe appearance oranges were easy to peel, sweet and juicy. So, it was with all those thoughts and memories that I boarded my flight for Kuala Lumpur after what will probably be the least festive Christmas Day of my life. With such a vast Hindu population this Christian celebration doesn't mean much to most Indians. Riding from the airport to the city in Kuala Lumpur, it was wonderful to relax in a quiet air conditioned bus with only half the seats occupied. When I looked out the window I saw footpaths at the edge of the street instead of dust and rubbish. I enjoyed my couple of days there before returning to Australia. When I arrived in Brisbane without my luggage so had a couple of days with only one set of clothes and no toiletries but it finally turned up. The joys of travel are many and varied… Despite the frustrations and huge physical demands, overall I've had a wonderful experience. It's been a great trip and I'm pleasantly surprised that I was able to follow my intended itinerary so closely. I thought the logistical difficulties may prevent me from doing so. Thanks so much for sharing the adventure with me!